It’s around 8 O’clock in the morning and I’m sorry about the delay for the part 3 of our Expire Web 2.0s Series. So we’re here again let me give you the highlights of our part 1 and part 2! 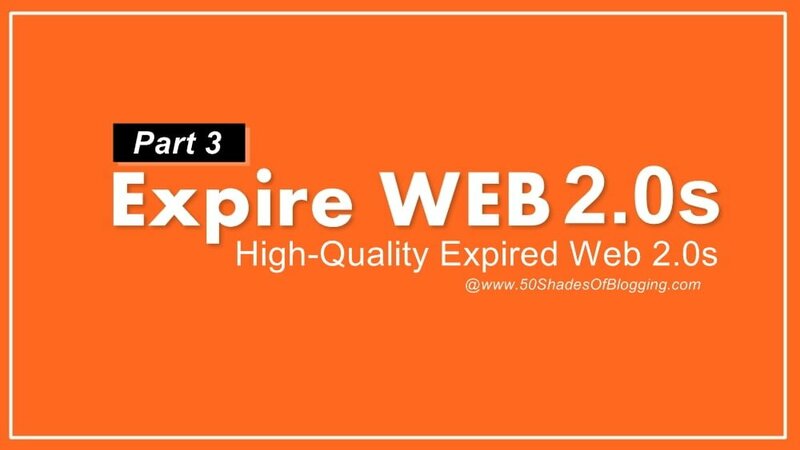 In part 1 we have learned that what are web 2.0s and scraped quality web 2.0s via using Ahrefs, and in part 2 of Expire Web 2.0s Series, we have bulk filtered only expired web 2.0 via using HTTP Status checking tools. In this part which is the “part 3” in the series, we’re going to learn how we can only invest our time and efforts to register only High-Quality Expired Web 2.0s. I can only write the “Quality Web 2.0s” but I’ve written, “High-Quality Web 2.0s” which means we’re going in more depth of learning the art of expired web 2.0s. What is High-Quality Web 2.0s? How to Find High Quality Expired Web 2.0s? I know you must be thinking what Is high-quality web 2.0s so I’ve decided to tell you little more about this. As you know that a backlink works when it transfers some of its own authority to our website, which we call transferring link juices also known as Dofollow Backlinks. And you also know that for transferring authority it must have its own which we call Page Authority (PA). So we’re going to find pre-loaded authority Expired Web 2.0s and register them for building backlinks for our website/blog. So without wasting time let’s dig in and find out high-quality web 2.0s from the list of expired web 2.0s which we have bulk filtered in the previous part. Note: If you haven’t read the previous parts of this web 2.0s series, I highly recommend you to read those parts before reading this one because you won’t understand this part if you don’t read the previous parts. We already have the list of only expired web 2.0s (which we have scraped in the 1st part and filtered in the 2nd part) now we just need to filter them. You need to take care of these basic things while building backlinks from any webpage, not just web 2.0s. Domain Authority (DA): As we’re talking about web 2.0s then you don’t have to look for the domain authority because it’s obvious that they have domain authority. Page Authority (PA): I’m telling you this again, for build backlink from any website you must have sure about its own authority because for giving backlink it must have its own authority to transfer some link juices to our web page. We’re going to filter high page authority (PA) Expired Web 2.0s to getting backlinks from it. Referring Domains: It’s one of the important factors which I personally look for because when a web 2.0s have some referring domains it becomes very easy to index them. Sometimes you don’t have to do anything, just publish articles on them and due to lots of referring domains (Dofollow backlinks), it gets indexed faster than usual. Anchors: It’s one of the most important factors while building not just web 2.0s backlinks, it’s very important to check anchors text while building backlinks from any web page. Because anchors define that how they have got their authority. Make sure that they don’t have any adult or spam anchors texts. Ignore those Expired Web 2.0s if they have adult or spam anchors text! You can check out my article where I’ve written the most important factors while building backlinks for any web page. Now let’s start filtering only the high-quality Expired web 2.0s. First, we’re going to filter high page authority (PA) expired web 2.0s and for that, we’re going to use some bulk Page Authority checker tools. I’m going to list out some best bulk page authority checker tools which I personally use. RobinGupta.com – It has a limit of 25 URL at once but it only shows 18-19 DA/PA due to that I personally don’t use it and it’s too slow. BulkDAChecker.com – It has a limit of 20 URLs at once, I personally don’t use this tool. SEOReviewTools.com – It’s a good tool but it has a limit of 10 URLs only which is damn low as compare to others. PrePostSEO.com – I just love this tool, its fast, it’s smooth and it’s awesome. I personally use this tool and thoroughly recommended. It has a limit of 20 URLs at once but previous it has a limit of 100 URL but now they have shifted to paid plan which has a limit of 200 URLs at once in 10$. This is all If you have any better option than please comment below and let me know that too. Now let’s start the step by step process of filtering only authority expire web 2.0s. I won’t go into much detail as everyone knows how to use any tool and it’s not a complicated tool. Open the PrePostSEO.com, and past 19 URLs from the Expired Web 2.0 list which we have filtered in the previous part. After that hit the “Check Now” button and wait for 10 seconds. It’s a very fast tool that’s why I personally use this tool. Use the same process for checking the entire expired web 2.0s and keep only 20+ PA expired web 2.0s. Advice: I personally keep only one excel sheet having all the details of expired web 2.0s. I created another sheet in the same excel sheet and add authority web 2.0s in it. When I check authority of BlogSpot blogs I only check for .COM authority because BlogSpot blog is GEO Redirected blogs. They redirect automatically when the country changes, so I stop that redirection via using the two lines of JAVA Codes which I’ll be sharing in the next part. I also tell you the whole process of building it from scratch & why I stop redirection. Now let’s check out the Referring Domains of all the 20+ Page Authority Expired Web 2.0s, we’re going to use Ahrefs for this and Ahrefs has features to get bulk details. With the batch analysis, you can scan up to 100 URLs, above screenshot is from Trail Account that’s why it’s limited to 2 URLs Only. You can use the FlikOver Service and get the access to full Ahrefs! Now let me tell you how you can filter only High Quality Expired Web 2.0s, as you know these all web 2.0s has 20+ page authority now we’re going to check Referring Domain Count and Anchors Texts. Referring Domains: If it has 10-15 referring domains and at least 5 Dofollow then shortlist it for next process. Anchor Text: Check the anchor text of the entire shortlisted web 2.0s if it looks clean then you’re good to go. Advice: You can check the availability of the web 2.0s first then you can check their Referring Domain Count and Anchors text for saving your efforts. Well, this is all I have for you in this part, in the next part I will show you the whole process of building it from scratch and some precautions which you need to take. really 3 Parts are awesome. Now waiting for other parts.